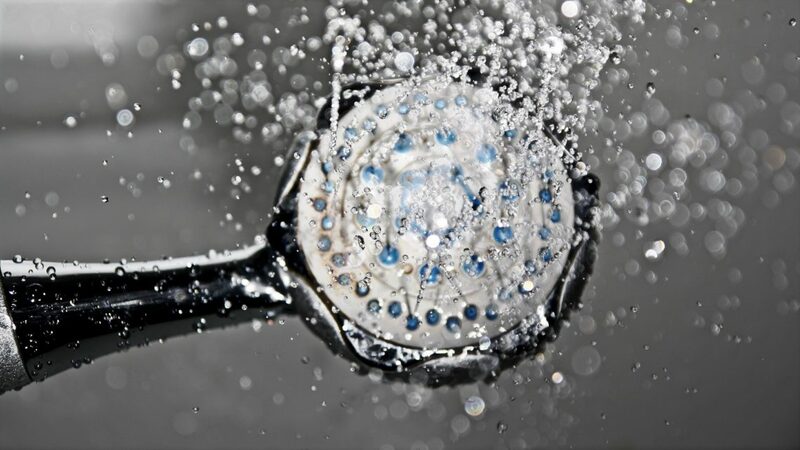 For those with reduced strength, balance and co-ordination problems showering safely can be a real problem. In addition, wet surfaces add to the risk of someone slipping and falling over in the shower. Simple shower seats for the elderly can make a big difference to helping a person manage this regular activity of daily living safely. Many of the shower seats are lightweight, sturdy and can easily fit into the smallest shower enclosure giving you increased independence and confidence with your personal care. These portable seats are available in a wide ranges of sizes and designs. 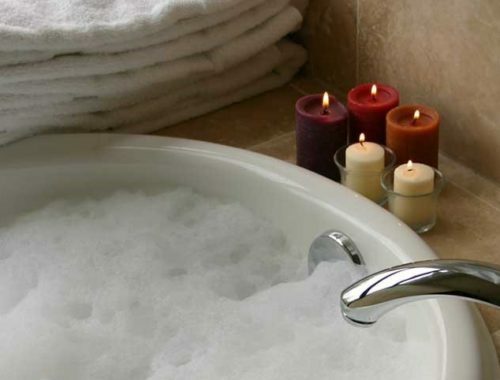 Many of the shower seats or chairs have back support as well, unlike a simpler bath or perching stool, which gives you more stability when sitting, particularly when you are tired. It very much depends on your individual need and preference, take the time to consider what is the most practical and affordable option for you before purchasing. 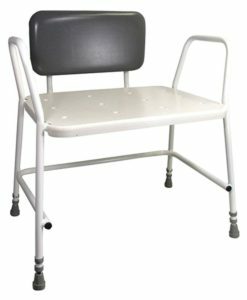 The Homgrace Aluminum Alloy Medical Shower Stool Bath Seat is lightweight and easy to move around. It comes with a fully sealed comfortable seat and backrest. The armrests and legs can be adjusted for the correct height for you. It also has slip resistant, non-marking rubber ferrules to hold it firmly in place when you shower. With its solid and sturdy support it gives the user added confidence when bathing, and is a popular style and choice for a lot of people. If you are a looking for a simpler option then the NRS Healthcare Height Adjustable Stackable Chair be a good choice. This chair has back support but perhaps doesn’t offer quite the same comfort as the Homgrace shower stool. Strength and stability are an important part of any shower seat, as it will be something that probably has a lot of use over time. This is where the ERN Shower Seat is ideal with its high strength and durability in wet environments. The seat can be easily adjusted to 6 different height settings to accommodate the different size user, and has a maximum weight of 200kg. 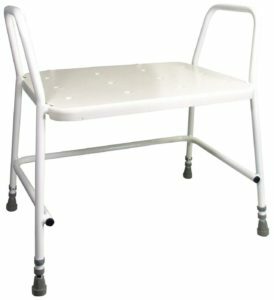 It is both lightweight and comfortable with easily adjustable leg supports, this shower seat is easy to clean and store away when not in use. 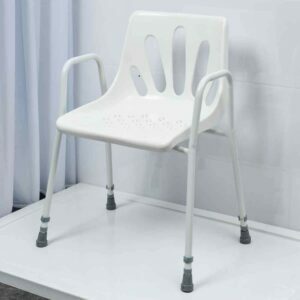 If you have good sitting balance and don’t tire easily then you could easily manage a shower seat without back support as well as without arms. They tend to be a little more compact taking up less space in the shower, and are better suited for people with limited space available. The Drive DeVilbiss Healthcare Rotating Rounded Shower Stool with Swivel Seat enables you to turn easily in the shower to reach for a towel, shampoo or anything else you need. It also provides easy access in and out of the shower, particularly useful for someone who has reduced strength or poor co-ordination. The seat is height adjustable in 2cm increments with a simple push button operation, and can easily be removed for cleaning. 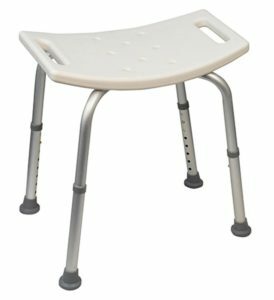 Another simple shower seat is the Days Height Adjustable Perching Shower Stool which is both strong and durable. 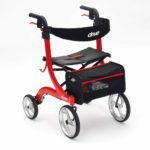 It has non-marking slip resistant rubber feet for good stability, and the slight incline of the seat lowered at the front makes it easier to transfer on and off it. When space is an issue, or perhaps other household members also use the shower, then you might want to consider trying a folding shower seat. Lightweight and compact, they can be left either in the shower when not in use, or in the bathroom for easy access. Also, they can be easily folded away for storage, or if needed when travelling, or on holiday. The Aidapt Shower Stool has a concave textured plastic seat offering good support when sat on, and even with its lightweight aluminium frame is able to accommodate a user weight of 136kg (21 Stones). 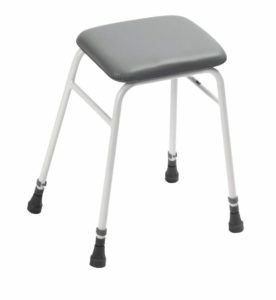 For extra support the stool has integral hand support to steady yourself, and 8 adjustable height settings. 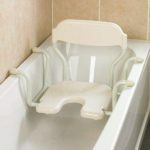 It has drainage holes in the bath seat to reduce the chance of slipping, and a durable corrosion proof frame. Wheeled shower seats are suitable for someone who has a walk in shower or wet room. They are often used by a person with restricted or poor mobility. Who might need this type of seat ? Correct Support – Does the seat have adequate support when in use. Arm, back and on some seats headrest helps a person’s stability and support when washing. Stability – Check that the seat has lockable swivel castor wheels on it for extra support when in use, and increase user safety. Space – The dimensions of the chair are important. Consider the space available to you – width of doorways and access in and out of the bathroom. 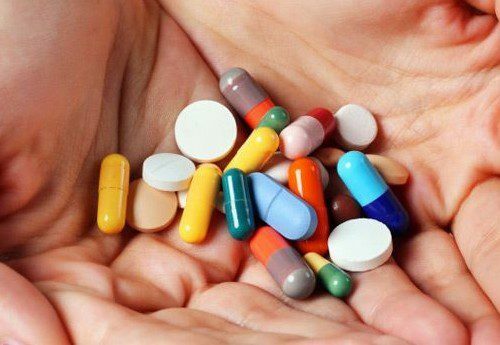 Weight – Check the products maximum user weight capacity as many have different restrictions. 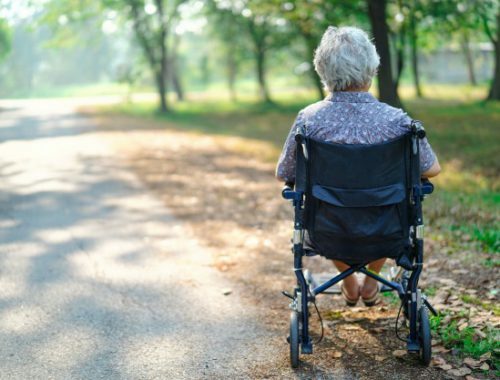 Also, check the weight of the chair as very often a family member or carer will be pushing the chair – you may need a lightweight version to manoeuvre easily. Storage – Some shower seats have storage pockets to allow toiletries, such as shampoo or soap to be accessed easily. 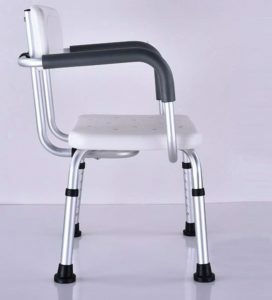 Durability – The construction of the wheeled seat is very important. Ideally aluminium is a good choice as it is not only lightweight, but also rust and corrosion free. Comfort – Padded comfortable cushion support is useful, particularly for people with pressure sores, or arthritic pain. 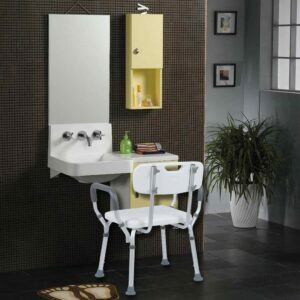 Combined with Commode – Do you need a basic wheeled seat or is an integrated commode chair a better option. 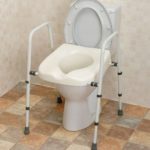 Many of the wheeled shower chairs double up as commode chairs, which saves the expense of buying a separate fixed or glide about commode. Footrests – Do you require integrated foot plates – many are height adjustable and also detachable. If you are looking for a permanent fixture in your shower or wet room, then wall mounted shower seats for the elderly are ideal. When not in use it can easily be folded away, and is particularly useful if other household members also use the shower. Wooden or plastic – which is your preferred choice ? Do you want it to match with your existing colour scheme / design in bathroom ? 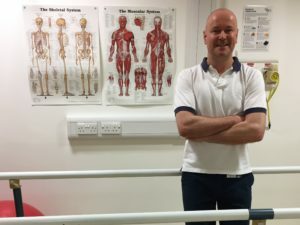 Do you need arm support when sat or can you manage without any ? Do you want added leg support ? Comfort and support – do you need padded arm rests, back or seat cushioning when sat ? Do you need a flat or curved seat ? 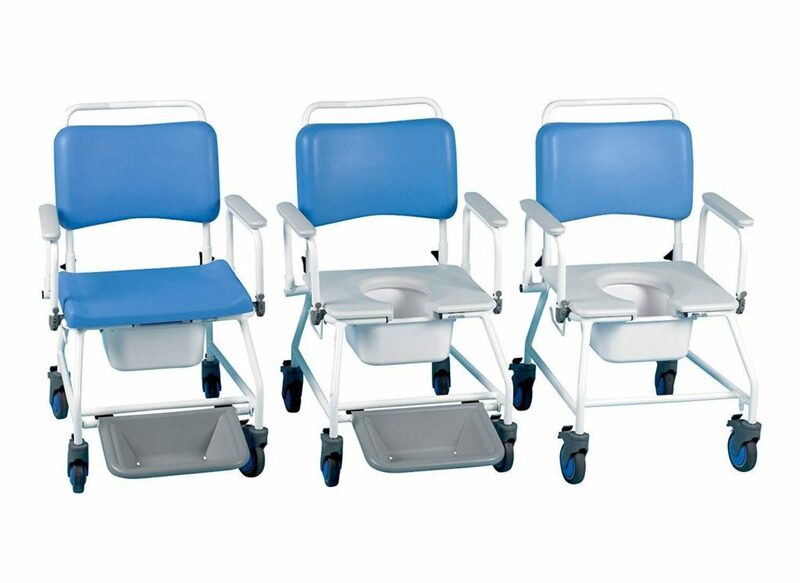 The Aidapt Portland Bariatric Padded Back Shower Stool can comfortably accommodate bariatric use with its wider seat. It is also height adjustable with a purpose made clip on / clip off perforated top for easy cleaning to maximise personal hygiene. It has side arms and comfortable back support, and is able to accommodate a maximum user weight of 254kg (40 Stones). 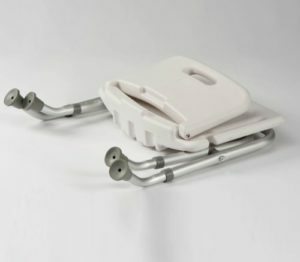 Also in the Aidapt Portland range is the Bariatric Adjustable Shower Stool which is wider to accommodate bariatric use. 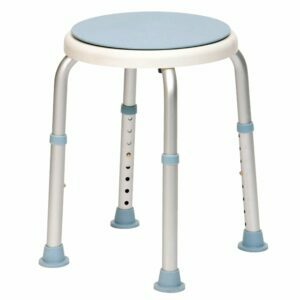 In addition to the easy removeable clip on / clip off perforated top which helps you easily clean the stool, it has good solid side arm support. 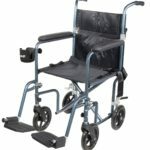 If you need an integrated shower / commode seat then the Homecraft Atlantic Bariatric Commode and Shower Chair with Footrests is ideal for assisting you in all areas of personal care. The chair is manufactured in a plastic coated steel, easy to manoeuvre and comes with detachable armrests and footrests support which easily fold away. It also has a front cut-out at the front of the seat to enable easier personal cleaning. The chair looks stylish with its attractive blue finish which is colour coordinated in both the brake castors and upholstery. It is available in two widths and has a maximum user weight of 225Kg (35 Stones). Hopefully, the above information provides a comprehensive guide to choosing the best type of shower seats for the elderly. Consider the various options available to you, as each person will have their own individual specific needs as to what style and type of seat they need. Really helpful review. I was about to purchase one for my grandma and thanks to your review I decided that I am going to get the wall mounted as it seems like the best solution in my case. I am glad you found the information useful for you and your grandma. Please get in touch if you have any questions about other products, and I will gladly try and help. 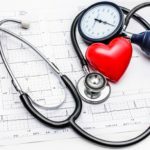 I use several of the things in this article. I have the armed shower chair, I have assist handles mostly in my bathroom. I also have a armed chair type gadget on my toilet to help me get up. I have Lupus so I need assistance. I signed up for your news letter. Very informative and useful information. Thankbuou. Thanks Deborah for your comments. 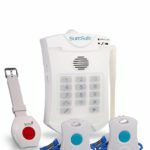 Please feel free to check out the rest of my website for advice, products and information on ways to prevent falls. fortunately I or non of my family are in a position whereby they would requite the use of these product just yet. you have explained the use of all these wonderful products very well and they are quite superb innovation in technology. Oliver, thanks for checking out shower seats for the elderly. If you need any help or advice in the future, or know of friends and family who need information, please get in touch and I will be happy to help.